I just got back from France a couple of weeks ago, and had the most amazing olive tapenade that I’ve been craving ever since. I amended the recipe I learned there and added figs instead, since our tree is still loaded (although I’m starting to have to fend off the birds and squirrels!) I used the dehydrated figs that I made on Monday for this recipe. Put all ingredients in a food processor, and blend. For a creamier consistency, add an extra tablespoon or two of olive oil. It makes a great pizza sauce, or could be eaten as a quick appetizer with bread and cheese. 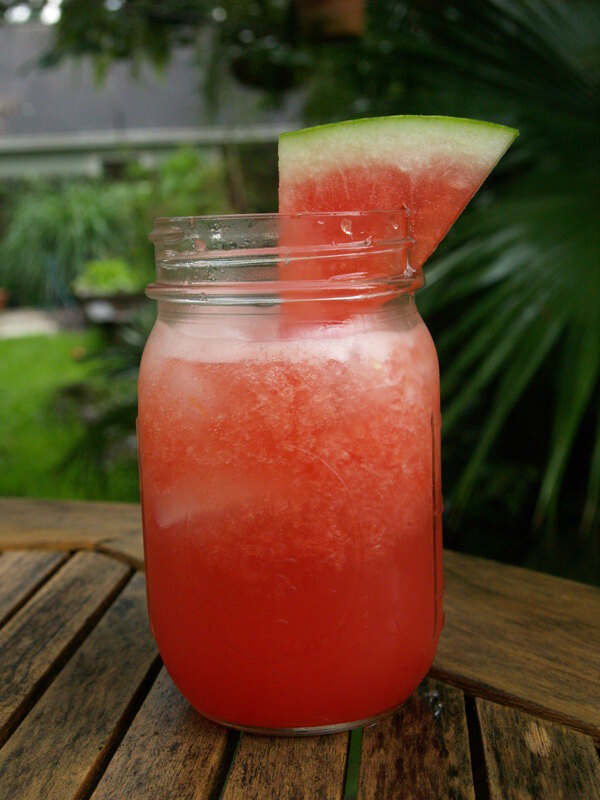 What is better than a watermelon drink on a hot summer day? Blend the pulp of a watermelon in a blender. Make sure it’s blended well, for you don’t want chunks in your drink. Next, fill a mason jar up with ice. Garnish with a watermelon slice or mint sprig, and enjoy on the back deck. I’ve tried many fig jam recipes, and this is my favorite. This recipe calls for liquor of some kind (hence the name), which I think allows the jam to maintain its jammy consistency. The other recipes that didn’t use alcohol, I have found, set up like concrete. No exaggeration. I’m not a chemist, but I think the alcohol prevents the natural pectin in figs from becoming too rigid. And, who doesn’t like a little kick in their jam? Remove the skin from the lemon with a vegetable peeler. Combine all ingredients into a sauce pan. Let sit at room temperature for one hour (the juices will come out of the figs during this time.) After the hour has passed, bring the mixture to a boil for one minute. Reduce heat to medium, and let simmer for 30 – 35 minutes. Remove from heat. I personally like the jam thick and chunky, but you can mash it with a potato masher if you’d rather have smaller fig pieces in your jars. Ladle into sterilized jars. This recipe should make about 5 eight-ounce jars, or 10 four-ouncers. Leave a 1/4 inch of space in the jar. Make sure the rim of the jar is clean before putting on the lids. Apply screw bands loosely. Put in a water bath that is an inch or so lower than the top of the jar. Boil for 10 minutes. The jam should last in a dark place for up to a year. It’s fig season here in North Florida! Growing up in the Midwest, fig trees are still so novel to me. Additionally, as a trained art historian, artists painted figs centuries ago to symbolize fertility and abundance of life. Even though summer here in North Florida isn’t ideal for growing–the summer sun is far too hot–figs are one of the crops that I’ve come to anticipate and enjoy. Dehydrating figs are easy. Wash and cut them in half and place them on a food dehydrator. Dehydrate them on medium heat for approximately 5-7 hours, depending on how you like them. I prefer to leave them a little chewy in the middle, but if you like them completely dry, let them go a little longer. Dried figs are fabulous as an appetizer with goat cheese and crackers, or as a mid-afternoon snack.